Selenite is a beautiful stone, a form of gypsum crystal. The name Selenite comes from the Greek word “Selene”, meaning moon (it refers to the crystal’s pearl-like appearance that reflects a soft, moon-like glow). Before the use of glass, Selenite was often used in windows, and may still exist in some buildings today, e.g. the Basilica of Santa Sabina at the Aventine, Rome. 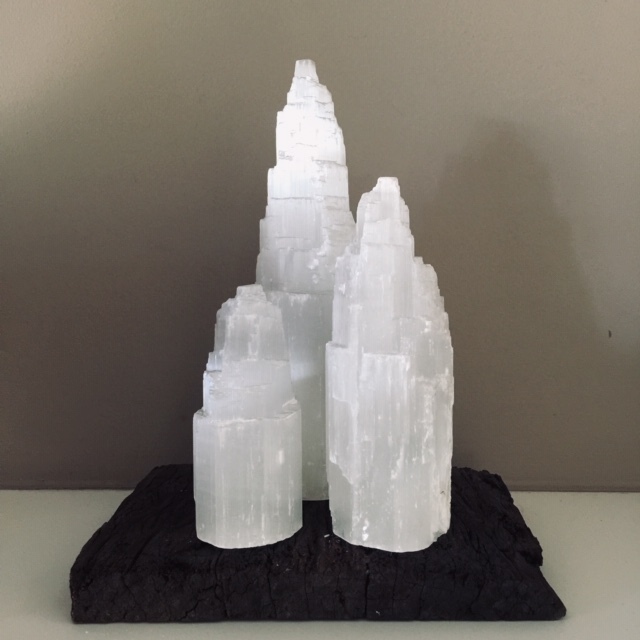 Shaped in the form of a mountain, our beautiful Selenite Crystal Towers come from ancient sea beds in Morocco. Selenite is a very soft crystal that can be scratched easily with a fingernail. It will also dissolve in water so ensure it is kept away from water. Small pieces of selenite may flake off so be careful when rubbing fingers over it as tiny pieces may splinter. Towers are not hollowed out for a cord and globe - they're gorgeous as they are! Our prices are exclusive of gst and shipping.